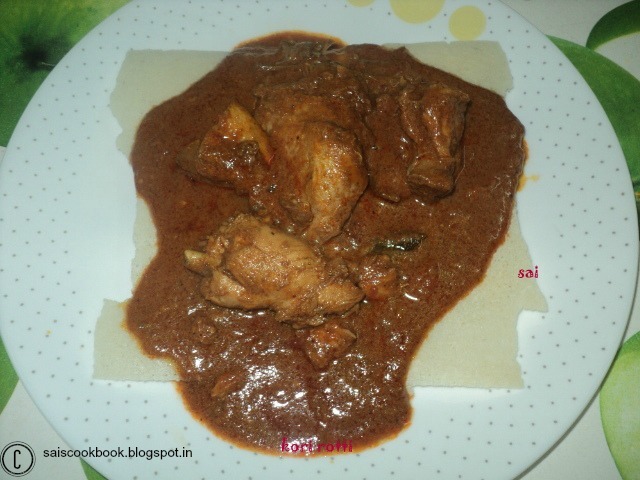 Kori rotti is a Bunt speciality and a famous dish of Coastal Karnataka.It is served with a combination of thin crispy crepes known as rotti which is prepared by grinding rice and a spicy chicken curry which is known as Kori . Traditionally ladies in the Bunt household used to prepare it at home , but now it is easily available in the stores and people buy store bought rottis at a very friendly price . It is served in most of the Tuluvas wedding or receptions. Heat oil in a pan and roast coriander seeds,mustard seeds,fenugreek seeds,cinnamon until you get a nice aroma. Grind it along with turmeric powder,both the chillies,cumin seeds,tamarind and garlic to a fine paste and keep it aside. In a cooking pan heat ghee add curry leaves and onions and fry until it turns light brown in colour. Add masala and saute further for 10 minutes,add tomato,chicken,salt to taste,sugar, water and cook until done. Once chicken is cooked add coconut milk and take a boil. Serve it hot with rotti.